Large Pro Makeup Aluminum Train Case Black Free Shipping Large Pro Makeup Aluminum Train Case Black Free Shipping [SB-2049] - $79.99 : MegaDiscStore, Your choices of High quality CD DVD Blu-Ray Replace cases! 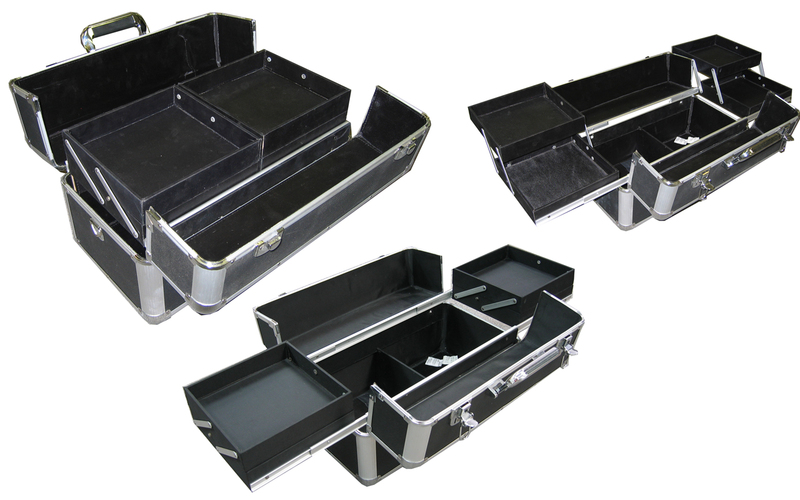 New design large size Aluminum Makeup Train Case, extra deep bottom section let you keep tall bottles easily, this large Makeup Case is equipped to store as many as your makeups and accessories. Easy to clean black liner inside. New security locks and keys. Four roomy trays slide on the aluminum track. Sturdy handle for added comfort and grip. Bottom section: 17 1/4 Length 8 1/2 Width 5 3/4 Depth, it divided into 2 equal section. External Color: Black ABS board surface, Silver aluminum frame construction, metal Chrome round corner.